An Auto-Play CD ROM will automatically start up and play when inserted in a drive on a PC. The Auto-Play function creates the files that will create an Auto-Play disk from your slideshow. AutoPlay.inf When a CD is loaded in a PC's CD ROM drive the system first looks for a file of this name in the root directory of the CD. The AutoPlay.inf file tells the system the name of the file that it should immediately begin to play. In this case it will be a Self Playing Show as described below. YourIcon.ico This file contais the icon file that will appear when the disl is referenced and in the player. To create an Auto-Play CD you must copy the files described above to the Root directory of the CD you are creating. This is easily done with whatever CD burner utility came with your drive or PC. The Root directory is simply the drives device letter. So if your CD burner is drive d: then just copy the files to d: and that it. When Auto-Play CD is selected you will be presented with a file dialog which will ask you to for a name and location for the AutoPlay.exe to be created. The .exe, the .ico and the AutoPlay.Inf are written to the same directory. After the name and location are selected the Full Screen dialog shown below will appear. Selecting the Full Screen box to Auto Play will cause the created movie to play in full screen mode. The software will attempt to maximize the resolution of the full screen movie by finding the "best fit" highest resolution mode available on the computer for the display mode. Selecting Close the player when show ends will close and exit the player on completion of the show. Leaving the box unchecked will keep the player open. Selecting the Custom Icon box lets you add personalize the .exe with your own icon. To select you icon (.ico) click on the folder icon and browse to your icon file and then select it. The Additional Files panel provides for the inclusion of all external files referenced in the movie. Clicking on the green "+" will bring you into a standard file dialog for the selection of Flash and image files that are externally referenced but not specified to be included in the SWF file. The movie is rendered after clicking on the OK button and the .exe file is created from the current slide show. The rendering process can take a while for a long show with a large sound file. 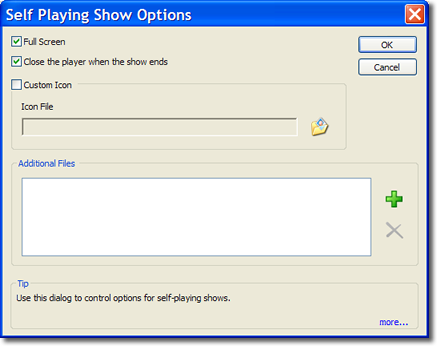 When the creation of the Self Playing Show is complete a dialog appears asking if the Show is to be played immediately or not. To create an Auto-Run CD you must copy all created files described above to the Root directory of the CD you are creating. This is easily done with whatever CD burner utility came with your drive or PC. The Root directory is simply the drives device letter. So if your CD burner is drive d: then just copy the files to d: and that it. A Self Playing Show is the combination of an SWF movie associated with its own player. Creating a Self Playing how creates a self extracting (.exe) file which when clicked on will launch the created movie playing in a stand-alone player. A Self Playing Show may be e-mailed, (you may have to remove the .exe and tell the recipinet to add it back in as many virus programs and e-mail systems block .exe files) added to a floppy (size permitting) disk, a CD Rom or downloaded. The recipient needs only to click on the file to view the movie. Self Playing Shows are the easiest way to send movies to friends, family and colleagues. Below is a movie / player combination created from slide show titled Chris 1. The controls at the base of the player, from left to right are pause, play, exit and Full Screen. Selecting Full Screen will hide the player frame and controls. Moving the mouse to the bottom of the screen will pop up the controls. Hitting the escape key will exit full screen play. If selected a Player similar to the one above will appear with the name of the slide show in the upper left hand corner. If immediate play is not selected the file is saved you are ready to more with the program.